Whether you’ve seen your rainbow or not, I’m certain there will be a time in your journey that Kim’s advice here will hit home. And plus, we could all use our BRAIN a bit more when it comes to our own health, right?! Thanks so much for joining the Patient Advocacy Series here. I was delighted to have such a positive response to Greta’s story last week (more on that here and her fertility journey with finding the right doctor) and am so excited you’re back for more. I tell you, we are certainly stronger together! Today we’ve with a very special guest sharing her journey advocating for her “birth wishes” during her recent labor and delivery experience. Kim really demonstrates how we can use our BRAIN to help guide our decisions even when it comes to the actual birthing experience. Kim reminds us that regardless of where we are on this road, it’s important to speak up, ask questions and be true to your desires as much as possible even in the challenging cases. Without further adieu, please join me in welcoming Kim Hoban from Kim Hoban Nutrition to the community today! Tell us about your experience. When did you realize the doctor/medical professional wasn’t listening to your needs? What did you then do? What was the end result? My experience advocating for myself began with my labor and delivery. 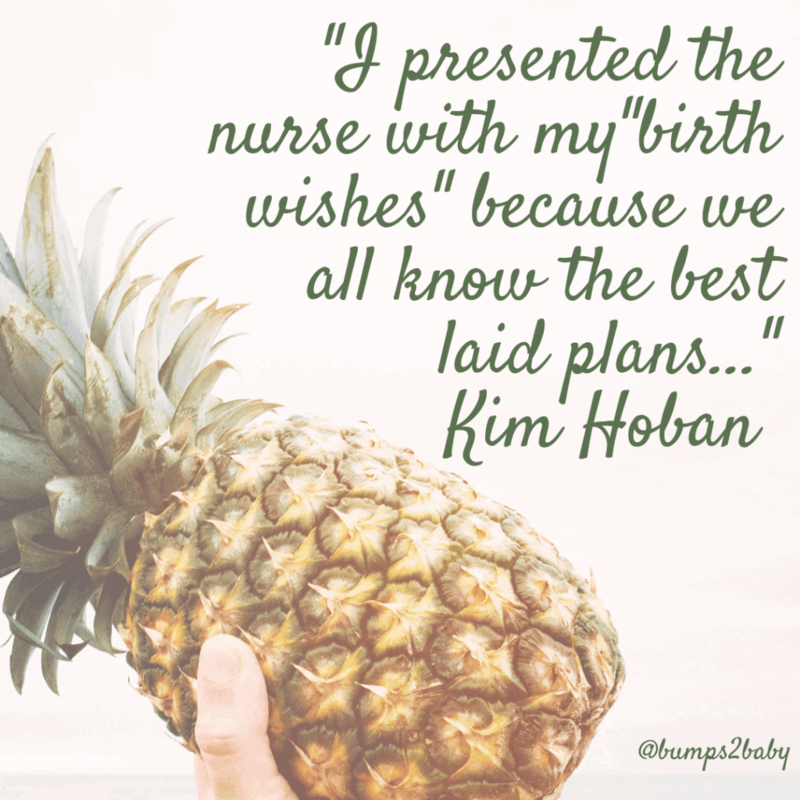 Although I was admitted to the labor & delivery unit at 40+1 to be induced, I presented my intake nurse with my “birth wishes” (not a “plan”, because we all know the best laid plans…). I was excited and relieved to learn that they were willing to honor all of my requests to have as close to a natural, unmedicated birth as my situation would allow. 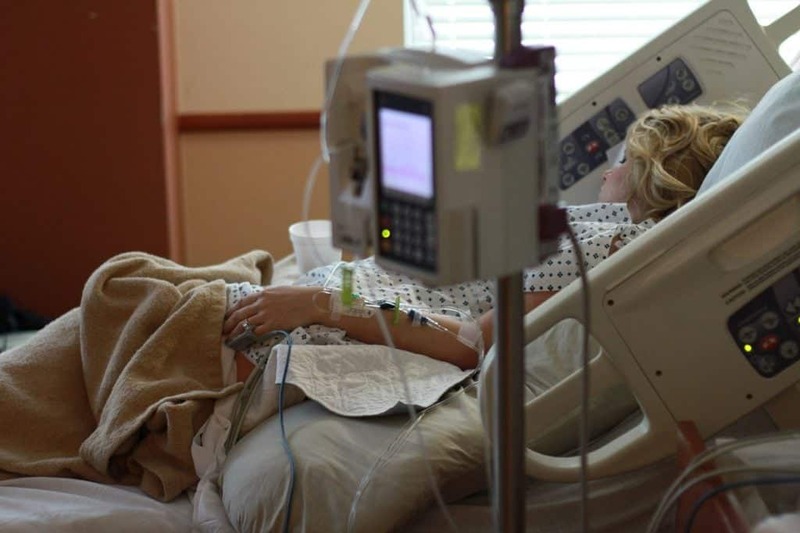 However, as time went on and the interventions didn’t progress my labor on what seemed to be the timeline set by the hospital residents (rather than my body or my baby), I began to feel a lot of pressure. Each time a resident came in my room, their recommendations came across as definitive actions and I had to begin advocating for myself. I asked questions. 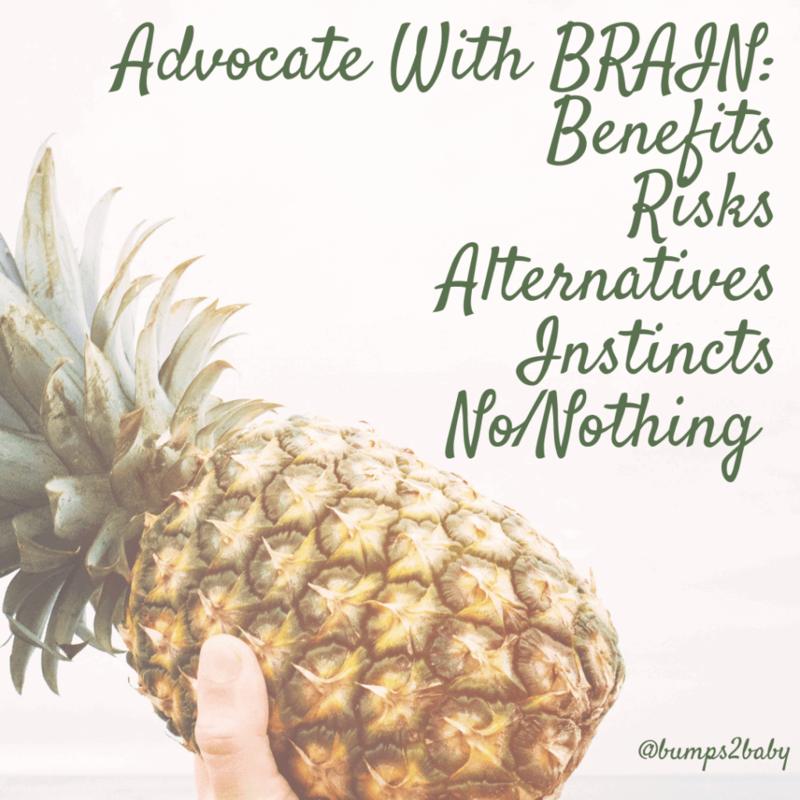 I remembered and used the acronym BRAIN (Benefits, Risks, Alternatives, Instincts and No/Nothing) to help make decisions. My partner and I asked for time to discuss options with each other and our doula before agreeing to anything. I’m sure the doctors labeled me as “non-compliant” or difficult, but I’m glad I knew that I was in the driver seat and had the support of my partner. It was not easy and I wasn’t treated the best by all of the medical team, but I hope that my experience had them reconsidering the ways they speak to and present information to their patients. In the end, my labor ended in a “belly birth”, but I felt empowered knowing that I had done everything I could have and was at peace with my decisions. I also advocated for myself with the cesarean procedure, asking for things that were important to me such as a clear curtain during surgery, milking the umbilical cord and immediate skin-to-skin. What motivated you to stay focused as your own advocate? These quotes became Kim’s mantra’s. “My body is safe, my baby is safe.” and “I embrace the unknown”—both from the Mama Natural affirmation cards! Wow, Kim. Thank you so much for being so brave and showing us that even when things don’t go quite as planned you can still find the silver lining and advocate for the things that matter to you, especially during such a magical time. 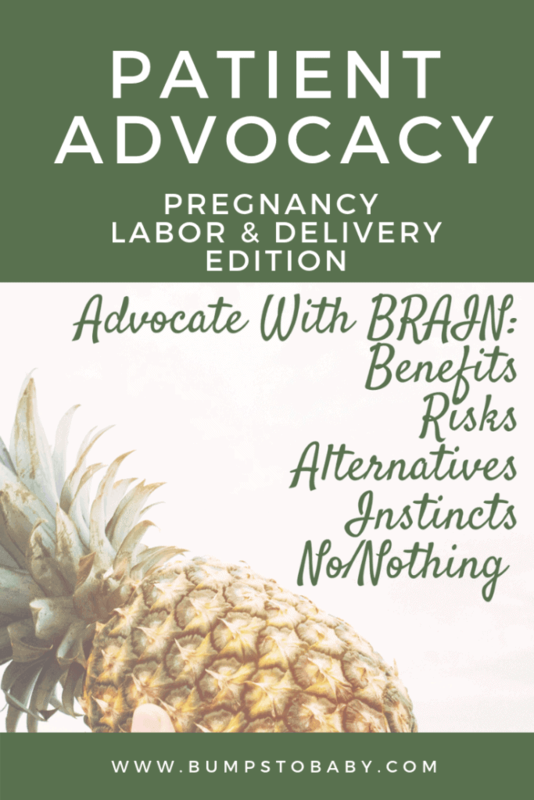 I cannot imagine after my own postpartum hell (more on that here) how I would have handled that particular experience but am so glad to have the BRAIN acronym in my toolbox now! Thanks Kim! To find out more about Kim’s entire birthing experience, feel free to visit Kim’s story here on her blog. Until next time my friends, sending you lots of love and hugs! If you’re interested in sharing a personal advocacy story, please contact me here! We’d love to have you. And for extra support be sure to follow @bumps2baby on Instagram for motivation and education and the private support community here!